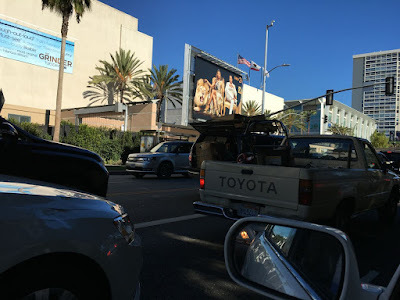 Last November I was back in Los Angeles for a conference. It didn't start until late afternoon so I had a good chunk of the day to experience the city. I convinced a good friend to join me on a sunrise hike along the Temescal Canyon Ridge in Pacific Palisades. 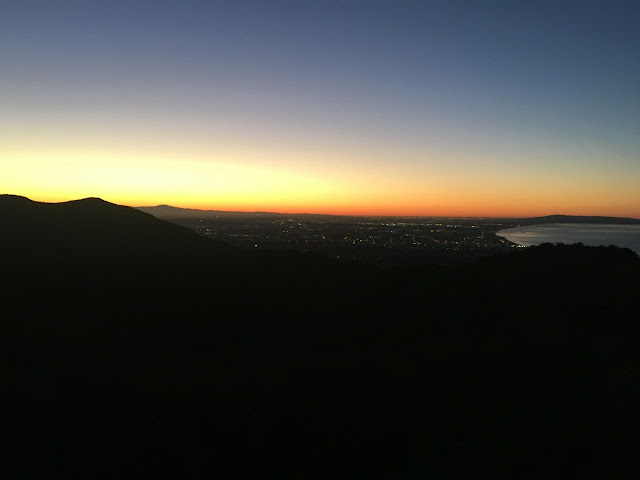 The is a panorama - featuring incredible views of downtown Los Angeles all the way out to Catalina Island. Just before sunrise, we had an incredibly clear shot of Century City, the Wilshire Blvd Miracle Mile district ... all the way to to downtown Los Angeles. In the distance were the San Gabriel, San Bernardino, and San Jacinto (120 miles away - above Palm Springs!) mountain ranges. This is a larger view of the same short, only with a different lighting setting. Thanks to a crisp November morning, the buildings all the way to downtown were remarkably visible. Los Angeles recently made Forbes Magazine's list of top ten most influential cities in the world (tied with San Francisco and Toronto). 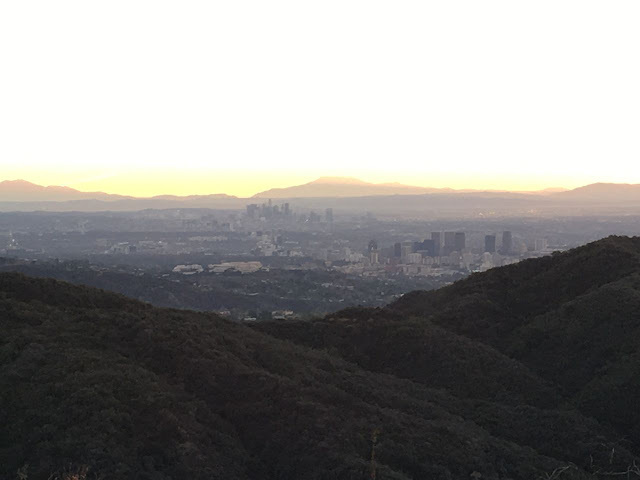 As a Christian and a college campus minister, I'm both amazed and sobered by the influence that "world cities" like Los Angeles have. Like London, New York or Paris - what happens in Los Angeles influences the rest of the planet. Walking back, a view of Santa Monica and the Santa Monica Bay, with the sunlight streaming down into Temescal Canyon. That's the Palos Verdes Peninsula visible in the distance. Even thought it was a Saturday morning - around 7am when we got back - we were the ONLY people on the trail. Forget Runyon Canyon! Seriously. 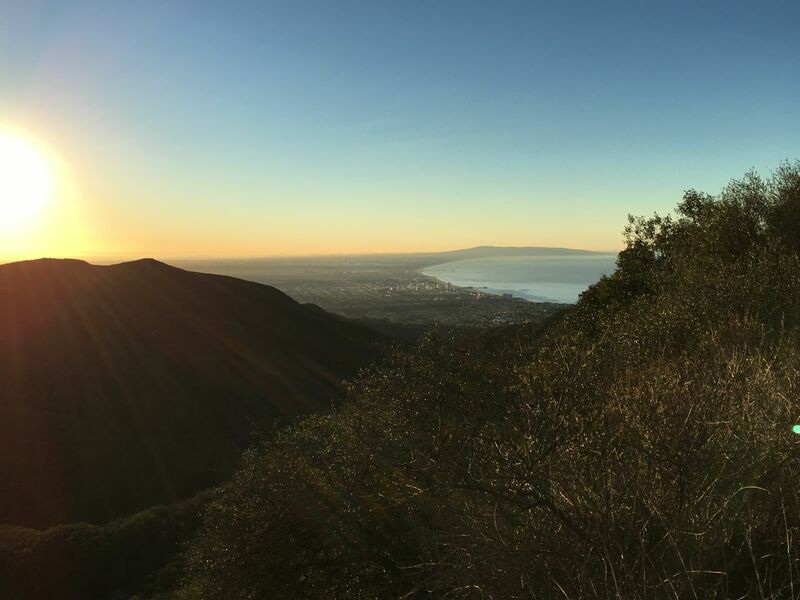 If you want an incredible, absolutely amazing hike - what I consider the BEST hike in Los Angeles - try the upper Temescal Canyon ridge trail in the Palisades. Here's a link with more info, photos, and a map. Enjoyed connecting with another friend in Santa Monica over breakfast. Solid Christian guy. After twenty years of living here, trying to make a go of it in the entertainment industry, he and his family have decided to relocate to Austin, Texas. Los Angeles is more than one of the most influential cities in the world. It's - unfortunately - also one of the most addition to being one of the most expensive. Probably a great decision - but he'll be missed. After breakfast, I drove east along Pico Blvd. Pictured above on the left, the Twentieth Fox studios. While the studio is closed to the general public, years ago a friend who worked there gave me a tour. Highlights included lunch in the studio commissary and seeing comic legend Mel Brooks walking around the backlot. Yet another reminder that what happens in Los Angeles influences the rest of the world. 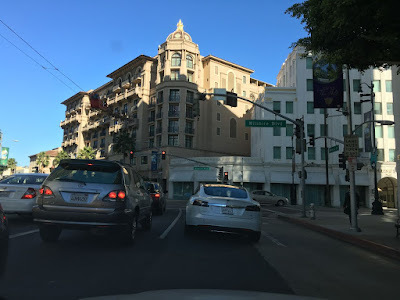 Wilshire Blvd and Beverly Drive in Beverly Hills. This was in mid November; a flying Santa was making it's way across the intersection of Wilshire and Beverly Drive. 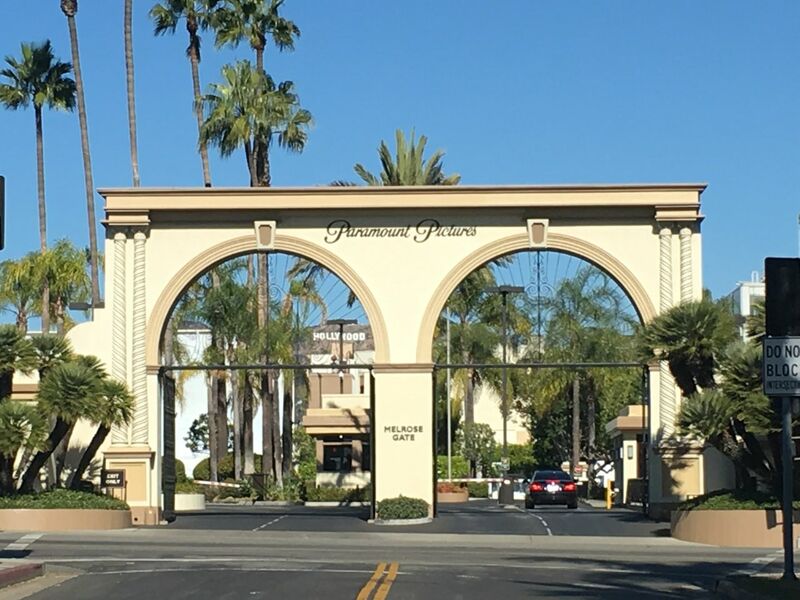 The iconic gates to the Paramount Pictures lot on Melrose Avenue. 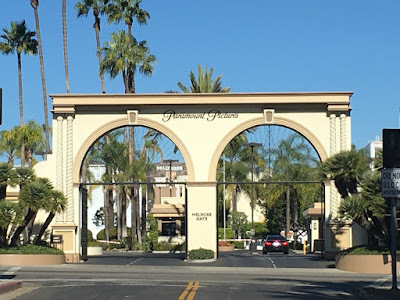 Paramount is the only movie studio that's technically in Hollywood. It you look closely, you can see the Hollywood sign under the left arch. This is at the corner of Melrose and Windsor Blvds. 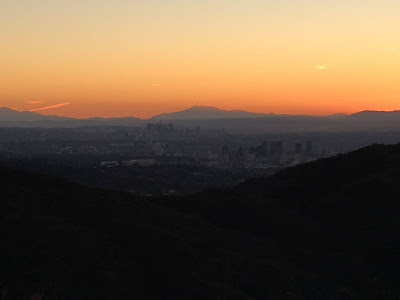 If you're planning on visiting Los Angeles, I'd suggest 1) renting a car to get around and 2) finding someone who lives (or has lived there) to show you around. Los Angeles is an amazing city, but can be a bit intimidating. If you don't know anyone who lives (or has lived) in Los Angeles, that's OK. Just be sure and do a bit of research on what you want to see and do. If you're planning on living in Los Angeles, make sure you have a plan. I cannot emphasize that enough. The days of just "showing up" in L.A. are over - about 40 years ago. 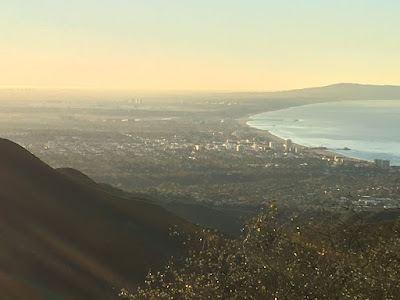 If you live in Los Angeles, you might (or might not) be interested in this multi-part audio series called How to Live In and Love Los Angeles by Rankin Wilbourne. Rankin is the senior pastor of Pacific Crossroads Church, connected with Redeemer Presbyterian Church in New York City. Pacific Crossroads is unique in it's embrace of both the historic Christian faith and it's unique role in a city like Los Angeles. Regardless of your religious or faith background, this series is both engaging and thought provoking. I had heard a lot about the renovation work on Echo Park Lake, and wanted to see if for myself. 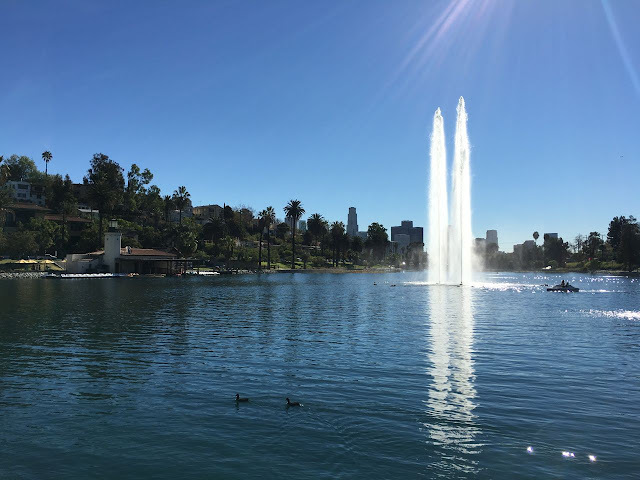 Echo Park is located three miles northwest of downtown Los Angeles, the office towers are visible in the background just left of the fountain. It was the Saturday before Thanksgiving, and - honestly - a pretty stellar day to explore this part of the city. More on Echo Park next time.